Now I have to point to the file to open - see photo. Okay, but why isn't right click > Go To Source working? Do you not have a MADS listing file (.lst) to provide the source code information? Without that all the debugger could do is open the file to the top, which is not very useful. Attached is the one I used for testing. Hi Phareon - Thank you so much for adding the Custom Shader feature. I use Windows with "Inverted Colours" to reduce eye strain and wondered if you knew of similar shader that would "Invert Colours" for Altirra ? I have googled extensively and could not find a compatible shader that Altirra didn't complain about having syntax errors, so they may have been in the wrong shader format. As always, great work on the emulator and it's much appreciated. Any chance for a "preserve high memory on cold reset" option. I typically emulate a 65C816 and set up a RAMDISK with the high memory. What's the hardware configuration that this corresponds to? I put in the extended memory preserve option because someone had battery backed up PORTB RAM, but I haven't heard of such for 65C816 linear memory. Avery... one thing which pops into mind when coding vbxe software... I might missed many powerful debug features but is there a way of single step the VBXE, too? 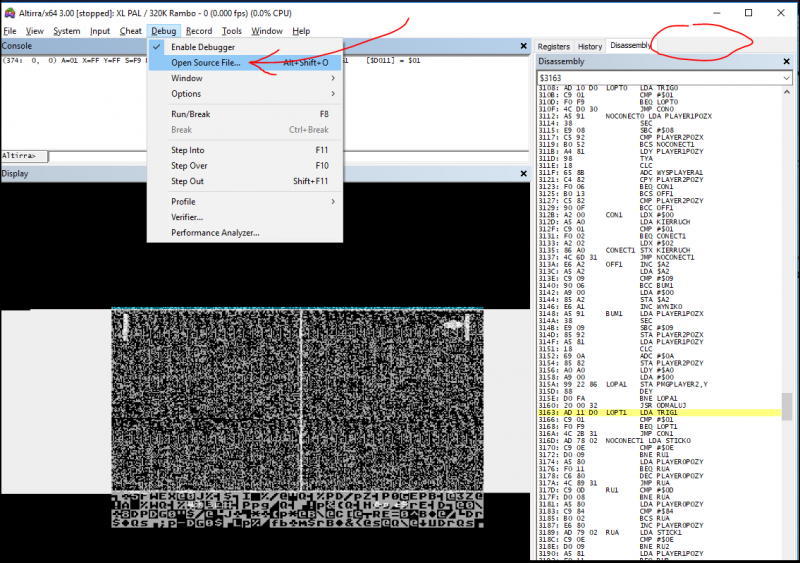 I mean I can use breakpoints and output eg .vbxe_bll but when you have chained thousands of bcbs I was thinking that there is a way to debug it in line with cpu? Ok. More precisely single step a bcb not only a chain. Edited by Heaven/TQA, Fri Oct 19, 2018 11:47 PM. Yes, confirmed from the VHDL, I'll fix it for 3.20. Wait, did the vhdl get released? Unfortunately I no longer use actual hardware. I had water damage at my home and that ended my run with the real iron. And now, even if I had the space (which I don't because it's been reallocated, you might say like sectors in a file system LOL) pricing and availability are not the greatest either. But I digress... to answer your question directly; I know of no actual hardware case where high/linear RAM has a battery backup option. So I guess I see your point if you are interested strictly in emulating real/legit/actual hardware that may be out there. I must say though that such a hardware solution would be just as worthwhile as it is for extended memory, for the same reasons and likewise for emulation of such solutions as well. For me, Altirra substitutes for actual hardware, so the idea of enhancements or new features excites me just as it would on real hardware, and even if it is exclusive to a software Atari. In short, I think it would be useful regardless if such a feature is actually available for real hardware or not. I think it would be cool! Edited by _The Doctor__, Sat Oct 20, 2018 9:54 PM. It's long gone my friend. Many of us know the pain of losing stuff in bad ways..
Maybe you will take another chance of if there's someone local who has a spare, either way Altirra will fill that space in its own unique way....Its not real hardware but its damn close and better in many many ways but we also love the real thing..
Edited by Mclaneinc, Sun Oct 21, 2018 4:06 AM. In many ways I find my virtual Atari via emulation to be superior. Especially in the areas of reliability and convenience. That is indeed, 100% what I was looking for... Kudos! I really don't have the space anymore anyway even if it all could magically reappear in working order. And like Keatah said, I too find the virtual experience to be superior now and also it is really convenient too. I'd rather feel uneasy about my original hardware from the 80's magically appearing out of thin air. It might be nice to see it and all. But beyond that..? I don't know, it would likely sit in storage or be packed away somewhere. Besides I don't have the desire to spend time restoring/cleaning/recapping/maintaining tons of vintage hardware. Though I religiously update all my emulators on a haphazard irregular basis. It's just a different form of getting involved and tinkering with something. In a weird sense I equate an emulator update to taking apart a console and making some imaginary nebulous change/fix/mod. Much of the reason I stay with emulation today has to do with my childhood obsession of wanting an all-in-one box that never breaks down and plays all my consoles. And today here we are! In fact, with emulation, I'm more into the (virtual) machines now than I was when I had real hardware. I an totally understand the non wish to keep (using a contractors term) 'making good' old machines and yes the space is a pain, back in the day the more the better for me in terms of hardware, I could have filled the house with it and ended up very divorced quite soon after but when you get to now we turn to the minimalist approach because sensible notions like 'living space', time and life in general take over. Its a bit weird, I've got my 3 beloved retro computers all setup around this desk but I still find myself going down the emulation line most of the time. And yes, the superb flexibility of a super Atari under Altirra just makes me smile and for debs must just mean a huge leap in dev work time in debugging etc. But still I do boot up my Atari with its SIO, AVG and matching monitors as I do with the C64 (Breadbin & C) with their Ultimate II cart or my Amiga 1200 with its Gotek drive in, I still love the real thing but the emulation also enthrals me, to be perfectly honest its a wonderful situation to be in, enjoy both or pack it away.....Nah....It stays for now.. I'll keep both out for the time until I have no choice (hope that does not happen), I'd hate to see the hardware go, like all I've worked hard, traded hard and where possible spent hard along with some amazing generosity from the group and it will sit out and get its small but needed uses.. I like real hardware .. that's why I let my friends have it. But really, it just takes space, and for gaming, you want those save states, good screen, controller freedom, recording, region free playing, and let's face, pirated software. yeah I know what you mean... I got my NES Pi, Pi with RetroArch, SNES Mini and will get PSX Mini... basement is full with reotro hardware... but still nothing can beat CRT+retro consoles... (my 1084 serves well so far...). I like to have the 800 XL (recently switched on again... nice nice machine compared to the 130XE) and my 800... sometimes I simply type on the keyboard and open the cart bay.... lovely machine, too. I DO keep and maintain my original childhood Apple II material. I don't think I'll ever get rid of it. I only unpack it from time to time. It's all sentimental value and I do +90% of my Apple II activities through emulation. TRS-80 Pocket Computer 1, 2, and 4. Those don't take up much space at all and they are childhood items too. Edited by Keatah, Tue Oct 23, 2018 10:01 AM.